If decapitations are your cup of tea, Night School is the one for you. Rachel Ward made her acting debut in this better-than-average slasher film. It was originally supposed to be directed by Alfred Sole, the guy who gave us Alice, Sweet Alice. The job eventually went to Kenneth Hughes, who made Chitty Chitty Bang Bang (!) over a decade before. The end result was a nicely shot thriller, with some exciting murders and a good twist ending. Anne Barron (Meb Boden) is a teacher's aide at the Jack-N-Jill Daycare Center in Boston. It's the early evening and the last child has been picked up by her mother. Anne is relaxing on the playground carousel when someone pulls up on a motorcyle, wearing a helmut. Anne is startled. Suddenly the stranger pulls out a machete and starts spinning the carousel. The machete is held up in the air and the terrified woman goes around and around - until she's struck with it. Judd Austin (Leonard Mann) is the cop assigned to the case. He is called to the scene and when he gets there, he sees a gruesome sight. The girl was decapitated and her head was put in a bucket of water nearby. The distraught director of the center tells the officer that Anne worked there during the day - and was attending night classes at Wendell College. At the hospital, Judd and his partner Taj (Joseph R. Sicari) discuss a similar case from the previous week. Another girl was found decapitated and her head was dumped in a pond. They wonder if there's any connection between the two murders. At Wendell, the administrator Miss Helene Griffin (Annette Miller) tells Judd that Anne was close to a girl named Kim Morrison (Elizabeth Barnitz). When asked if Anne had a boyfriend, Kim tells the officer that the murdered girl was indeed involved with someone but she doesn't know who it was. She assumes the man must have been married. Judd enters Professor Millett's anthropology class to speak with him about his murdered student. 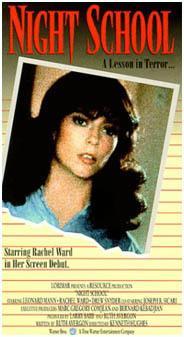 The professor doesn't offer much information but he introduces Judd to an exchange student named Eleanor (Rachel Ward). Eleanor leaves the school and goes to the local diner. There, she is creeped out by Gus (Nicholas Cairis), the busboy who appears to have mental issues. Carol (Karen MacDonald), the waitress...asks Eleanor if she's in Millet's class and implies that he sleeps around. This irritates Eleanor and she leaves. Gus follows her home. When she realizes this, she runs the rest of the way and quickly locks the door. She gets into the shower but someone is trying to break in. Frightened, she gets out of the shower...only to find that it's her boyfriend who had been locked out by accident. That boyfriend is Professor Millett. Anne's friend Kim is working at the local aquarium. About to leave work, she takes off her diving suit. She is attacked and savagely killed with the machete. A woman looking at the sea turtles screams when she sees Kim's head fall to the bottom of the tank. Judd pays a visit to Professor Millett and is surprised to see Eleanor...but she explains that she is the professor's research assistant. The officer then informs Millett that a second student of his has been killed - and asks him if he has had any affairs with his pupils. Millett is annoyed at this line of questioning and tells Judd to leave. Eleanor and Millett get into an argument and she goes to the diner to be alone. The professor follows her and she tells him that she is three months pregnant. He's sympathetic although he still manages to flirt with Carol as she waits on them. After the diner has closed, Carol is left to clean up. When the power goes out, she heads to the basement to investigate. The killer is after her and she is attacked with the machete. Carol manages to get outside but she is caught in an alley and mutilated. When one of the workers shows up the next day, he thinks someone has broken into the diner. A customer finds hair in his bowl of stew. Carol's head is discovered in a sink filled with water - and her body is found in a dumpster. Judd and Taj go to Gus's home...since he is now considered a prime suspect. But Judd doesn't really believe the troubled man was involved. When Judd goes to Professor Millett's home again, he is surprised to find a collection of skulls...taken from tribal head hunters around the world. Eleanor doesn't see anything wrong with this. At Wendell, Miss Griffin tells Millett to stop sleeping around with his students. She counsels Kathy (Holly Hardman), who confesses that she too has been intimate with the professor. Miss Griffin, however, seems to have her own ideas about Kathy. She invites the girl to spend the night at her house and the two sleep with each other. The young student is not entirely comfortable but she is enjoying the company. Miss Griffin is killed when she gets up to answer the phone...and Kathy is murdered shortly after she finds the older woman's head in the toilet. Judd is on his way to speak to Miss Griffin when he sees the killer fleeing. He chases the psycho to Professor's Millett's apartment. Taking off the helmut, the killer is revealed to be Eleanor. She confesses the killings to her lover and justifies the crimes by comparing them to tribal rituals he teaches in his courses. As the police are closing in, Millett puts on the helmut and flees on his motorcycle to deflect attention from his pregnant girlfriend. During a high speed chase with Judd and Taj, the professor is struck and killed. Eleanor attends his burial...and the police believe the case has been solved. Director Kenneth Hughes keeps the action flowing nicely and great use is made of actual Boston locations. The motorcycle killer is a nice idea and there is some fine suspense here. Even though the psycho in Night School isn't really that much of a surprise, it's always refreshing when the psycho turns out to be a woman. Rachel Ward's classic looks and breathy voice are simply stunning. This one is a solid thriller/slasher with a good plotline, some inventive killings, and an anthropological flavor tying it all together. Who woulda thought it?